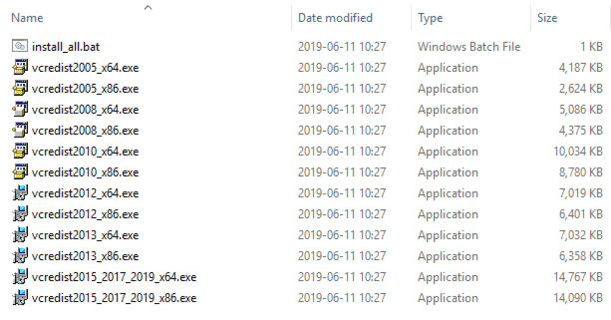 This archive contains the latest version (Oct 2018) of all Visual Studio C++ runtimes, installable with a single click by running the included batch file installer. Included are the runtime packages for Visual Studio 2008, 2010, 2012, 2013, 2015 and 2017. Both 32-bit and 64-bit are supported. The files included are the English language version. When reinstalling Windows, it's recommended to always install all the various C++ runtimes, which is why this all-in-one pack was created. It helps to avoid problems with programs that cause error messages like "side-by-side configuration is incorrect", or "Missing MSVCRT.DLL" or "MSVCP140.DLL". This package is created by us here at TPU. All files are digitally signed by Microsoft, which guarantees they are unaltered.